COLUMBUS, OHIO – The Columbus Blue Jackets have signed goaltender David LeNeveu to a one-year, two-way NHL-American Hockey League contract, General Manager Scott Howson announced July 7. As is club policy, terms were not disclosed. LeNeveu appeared in 67 games for Salzburg of the Austrian League in 2009-10, posting a 2.58 goals-against average, .906 save percentage and two shutouts. He was 6-2 with a 2.17 GAA in nine playoff games to lead Salzburg to the Austrian Championship. A native of Fernie, British Columbia, LeNeveu was Phoenix's third pick, 46th overall, in the 2002 Entry Draft. 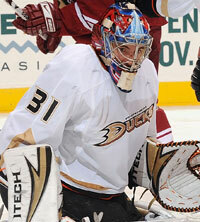 He went 5-9-2 with a 3.38 GAA and .888 SV% in 21 games with the Coyotes from 2005-07. He also owns an 87-116-21 record with a 2.82 GAA, .909 SV% and seven shutouts in 231 career AHL games with Springfield, Utah, San Antonio, Hartford and Iowa. LeNeveu (pronounced LEH-neh-voo) played two seasons at Cornell University from 2001-03 and went 39-5-2 with a 1.29 GAA and seven shutouts in 46 games. In 2002-03, he was 28-3-1 with a 1.20 GAA and nine shutouts in 32 games as Cornell reached the Frozen Four. He was a finalist for the Hobey Baker Award, was named the ECAC Co-Player of the Year, ECAC Goaltender of the Year, NCAA East First All-American Team, ECAC First All-Star Team and was the ECAC Tournament MVP that season. He owns the NCAA Division I record for career GAA (1.29) and helped Canada to a silver medal at the 2003 World Junior Championships.